1. The first thing you need to know about the van used in the 2010 “A-Team” movie is that it is an imposter! 2. 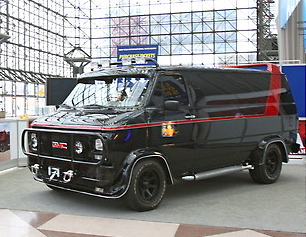 The “A-Team” van – the authentic one used in the 1983-87 television show – was a 1983 GMC Vandura cargo van. The one in the movie is not. Read on, truthseekers. 3. It is difficult to tell a 1983 Vandura from a 1971 – or a 1995 – or any year’s models in between. Yes, General Motors made virtually the same van for 25 years. It’s that kind of innovation, ingenuity and integrity that has made Detroit what it is today: A ghost town. 4. While GMC was churning out the Vandura, Chevrolet was producing its own version – the virtually identical Chevy Beauville. Internally, they are known as G-Series or G20 vans. These are “made in America” specials – products of union labor in Ohio and Michigan. Built to last – until the warranty expired. 5. 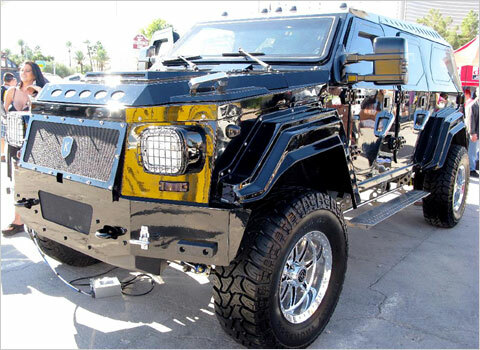 When the producers of the 2010 movie were considering what incarnation the team’s vehicular transportation should take, they initially considered the Knight XV. The XV is a $295,000 armored vehicle, based on a Gurkha military transport, that is made in Canada by Conquest Vehicles. 6. Another Canadian firm was tapped to come up with a replica of the A-Team GMC. Why Canada? Because the movie itself was filmed there. Outta the way, boys! You’re standing in front of the real star. “There is nothing,” Mr. Rasmussen noted, “that is special about these vans.” So, moviegoers are likely to shed few tears when these vans are blown up, torched or crushed. Previous owners may even cheer. 8. How is the movie version of the van different from the old TV version? (See photo at end of article.) Visually, there is the paint job. The original had a medium gray-on-black scheme, with an almost diagonal red stripe separating the two colors. The new one is a dark charcoal-on-black black, with more of a “hockey stick” stripe. “We gave the stripe a new feel,” Mr. Rasmussen said. “The colors are very close.” Really? They don’t look the same. The wheel flare kit has been integrated into the body; the original flares were just cheap vinyl cladding (a GM specialty, although these were probably aftermarket items). The new van has three sunroofs; the old one had approximately none – although at least one of the six used in the TV show’s run had a custom pop-up glass sunroof added. A similar-looking craptastic Genuine GM Replacement Parts plastic grille was installed, complete with a phony “GMC” logo. The stock 170-horsepower (!) 5.0-liter V8 got a new high-volume intake manifold, snazzier fuel-injection system, and a souped-up computer chip controlling engine power. It has freer-flowing exhausts, a posi-traction rear end for impressive burnouts, and fire-resistant 15-gallon racing fuel cell. For fuel mileage, it gets something in the single-digits. 9. What happened to the vans after the shoot? Twentieth Century Fox has the leftovers locked up in a warehouse. 10. Will the A-Team van ever ride again? Can you say “sequel”? No word on that yet, but Fox has cleaned up one of the vans, and has shown it at places such as the 2010 New York International Auto Show last April. And it even made a cameo appearance in the 2010 Gumball 3000 road rally the month prior to the movie’s June 11 release. Skateboarder Tony Hawk asked for, and received, permission to drive in the race’s North American portion. “He said it was fun,” Mr. Rasmussen noted. “But with that 15-gallon tank, he was forever running out of gas.” Sort of like the movie. The real a-team van had a sunroof. There are many scenes in the show where someone is shooting out of the sunroof or climbing in it. The A-team van had aftermarket fiberglass fender flares, not factory plastic ones. Lastly, the “reel Mccoy” you have pictured is not in fact the real van. It’s one of many replicas. Thanks Daniel. At the end of this article (see above), I’ve now included a publicity photo from one of the original A-Team television episodes, with Mr. T driving. (Note CA blue license plate.) This van has a smooth roof, with no sunroof. This type of van was not available with a factory sunroof. Of course, there were many different vans used in the television show, because they were frequently destroyed. Although I don’t claim to have seen (or to remember) every episode, I agree with you that occasionally someone was seen shooting out of a hole in the van’s roof. When the plot called for that, they modified whatever vehicle was being used that week accordingly. The fender flares were not from the factory, and were available through the aftermarket or dealerships. The “reel McCoy” van claims to be one of the production leftovers, but it is very difficult to verify such claims. There seem to be thousands of replicas and knock-offs of the original Vandura. It was a fairly easy design to poach. Yeah, they used so many vans – with & without sunroofs – in the TV series…even within the course of some episodes, it’s hard to keep track of them all. Just watching – and ignoring the ridiculous plots – what is going on with the vans gives almost second life to the show for me. I just watched every single episode back to back over the past couple months (thanks to netflix), so i can say without a doubt that the van most definitely had a sunroof. Also, it was my favorite show growing up as a child, so most of them were burned into my memory anyways. I’m actually working on a replica van at the moment so i studied the van pretty closely. The picture shown with Mr. T driving is hard to tell if there is anything there or not, but given that you cant even make out the ribs on the roof (which are much more substantial than the sunroof), I’d say that the glare is obscuring the view. The “Reel McCoy” van has so many incorrect parts on it that i doubt it is anything other than a replica. The running boards, headlights, fog lights, mirrors, grill, door handles, etc… the list goes on. BTW, my van is about 250k miles over the warrantied mileage and is still running strong. You watched every episode? I applaud your dedication. I doubt this’ll reach anyone almost 4 years later, but how’s your van coming along. I too am wanting to build one sometime soon. Well when you dont have cable, it’s either that or the Wendy Williams Show…. nuff said. Having watched every episode back to back, it was funny to see how many scenes were stolen from previous episodes. Most car wrecks, van burnouts, chase scenes, etc. The beginning action scenes of the very last episode were made up of scenes of an episode from one of the early seasons. That’s why they call it the “Magic of Television”. I found a series of pictures and some information here about the original A-Team TV show vans. Supposedly there were six. I think there were more. While several of the pictures show a small aftermarket pop-up glass sunroof, one photo shows that at least one of the vans had nothing on top besides no-skid tape for roof-riding stunts. I’ve read that before, and i dont really see facts to back that up. It’s just what some guy posted on the internet. There are said to be 2 vans. Judging by dents in the van seen in the show, that does make sense. It’s fairly easy to identify a vehicle if the same dents are in it in almost every episode. As far as stunt vans, i dont really consider them the a-team van. If i did, then the van was not only a 1983 GMC, but a 70’s chevy/gmc, and a ford econoline. They jumped/rolled/sank plenty of a-team stunt vans. I dont know what questions you were refering to, but i didnt ask anything. He is 100% incorrect about the fact that they reuse clips from previous episodes though. Also, i didnt say it was only in the last series, i was just mentioning one specific scenario. There were clips reused throughout the whole run as well. I didnt believe it at first, so i went back and even double checked the original episode the clips appeared in. Yeah, the one glaring scene I remember them reusing was from the episode where they went to Las Vegas to rescue the scientist. (I think it was in Season 1. Could have been Season 2 but I’m not sure). It was the chase scene with the van right after they leave the Vegas hotel. They reused that scene a few episodes after. Toward the end of the show’s run, it seemed like they re-used entire scripts! The series are still running on dutch tv. i love it. now im grown up i look diferent to it. a funny detail: wenn the cars makeing a burnout they make nois like theyre on concreet road, but actually they drive on dirtroads. the movie is a bad remake of a succesfull series, dissapointing. Good question, that one. I don’t know of a one-stop-shop for old GMC Vandura parts. Best suggestion I can offer is to check eBay Motors online and look for the items you want and/or the folks who specialise in those sorts of things. The shipping from the USA, however, might be a deal-breaker! Happy hunting! Go to trucknvans.com. They have the A-Team parts and accessories you need for either the original 80’s TV version or the film version. Wow!…that’s a lot of hate on American vehicles from someone who obviously has no personal experience with the subject he is writing about, you must drive a prius and weep for the rain forest whenever passed by something larger than a pack of smokes. All of your assertions that were made are way off base and biased by a skewed paradigm of “old and big are bad”. Between my parents and me, we’ve had 5 vans of this flavor (and no they were not unchanged for twenty+ yrs the 93′ was by far the sexiest van of any company ever, and quite up there of any model for that matter). However, I have also owned vw, 01′ olds, 66’pontiac, Chevy(cars, full and compact trucks & blazers), motorhome, camero…I’m not biased is what I’m saying. Your comments on longevity are way off based and unfounded, as 200k+ mile mark is routine and expected without trouble, and 300k is no problem. The issue is road salt eating the body away…not many of any type of vehicles pre 93 are left where I’m at. The 93 I’m currently driving has crossed the country multiple times, has towed a 30′ camper often, and even a 14’x70′ mobilehome w/o roof or walls for 10mi. Reliability is quite good on the g-series vans by any standards. Modern vehicles, no matter the make, when you Google them you find they all have an Achilles heel of their own. All designed to fail after warranty so you need new…that’s how they stay in business. It’s no longer a “stock 170hp” with the mods you mentioned, and very well may get in the single digits for mileage,as it might be pushing 400hp. You seemed speculative, and came across as if these vans have anemic power and horrendous mileage. My 78 averaged 18mpg, and this with an 18-23yr old beating the snot out of it worse than b.a., once even pulling off a fig 8 burnout on pavement with 5 passengers. Current full-size vehicles are often rated in the mid teens. The A-team van is a character itself and is represented as sunroof equipped. To compare the non-equipped stunt stand-ins as interchangeable equals is to say a lead actor is equal and interchangeable his double for any scene regardless of appearance or abilities. If you don’t know or care about something that’s ok, just don’t think that apathetic ignorance is a reason to bash it, perhaps try reporting on something you enjoy. Good day, I am Mr. Peter Nelson, And I work with United Foundation Security Company Limited, (Accra-Ghana), Also I am in charge of our Security Warehouse, where all Treasure Boxes are being kept. as matter of fact last month the 21st Of April 2013, I discovered Three trunk boxes deposited under our custody by late (DR.DARRA JAMES RAJ) who was an (INVESTOR) Also he was from (NEW ZEALAND), and two of the trunk boxes contain 200 Kilograms of gold, while the other one contains USD $100 Million. And i have gone through Investigation, and after my final investigation I now understood that these trunk boxes had been deposited In this company since June 4 1992, which non of the Deceased family or relative have appeared since then to claim these boxes out of this Company. There is a deal here if you have an interest, please get back to me quickly so that i will fully update you with the full information that will be required from you, so that this fund and the gold can be moved out of this company without any problems. and do you agree with me that immediately this transaction went successfully 20% of total amount involve will be donate to the charity and disable organization?. This is such wonderful news! I’ve been waiting for an opportunity such as this since I missed out on that other offer from Nigeria or Zambia or wherever it was when my unknown uncle died and left me all that money. You mean to tell me that there’s nowhere I can go to see an ACTUAL A-Team van? ie one that physically appeared in the TV show? One that can and is verified as 100% authentic? Prettty ice post. I just stumbled upon your weblog and wanted to say that I’ve truly enjoyed surfing around your blog posts. Hi Jerry, I’m a huge a-team van fan, I even owned my own replica for a decade until I had to sell it due to ill health. The Reel McCoy van is in fact a replica and not a very good one at that! My website http://www.a-teamautos.co.uk has a database of around 120 replica a-team vans from all over the globe with more replicas being added soon. I’ve also got a Facebook page about the van. I hope you don’t mind if I put the links up, people may find it useful if they are building a replica of their own. Thanks! Good info. Check it out, readers. Hello – how do I find an A-Team van for sale? I don’t need the exact perfect thing….just something very very close. I am a huge A-team fan and would like to buy a van. Please advise – thank you very much. Google it. I see them for sale quite often on the internet. No, what killed Detroit was the lack of faith in God, liberal Democrats and their state sanctioned mandated Unions. Hello, Mr. G! Thanks for the article detailing the differences between the original A-Team TV series Vandura and the 2010 movie “imposter”. I appreciate the trivia and the links. I designed a Lego version of the iconic A-Team van and am campaigning to turn it into an official Lego product. If my project on the Lego Ideas website reaches 10,000 supporters, the Lego company will review it and consider it for production. (That’s how we got official Ghostbusters Ecto-1 and Back To The Future DeLorean sets.) Supporting projects is free. Thank you! Thanks for this article, and the one about the stunt-persons behind the show. Maybe it’s just nostalgia talking, but the movie van just feels like a careless knockoff. Supporting is free and projects that reach 10k will be considered by Lego for production as an official set. Thank you! 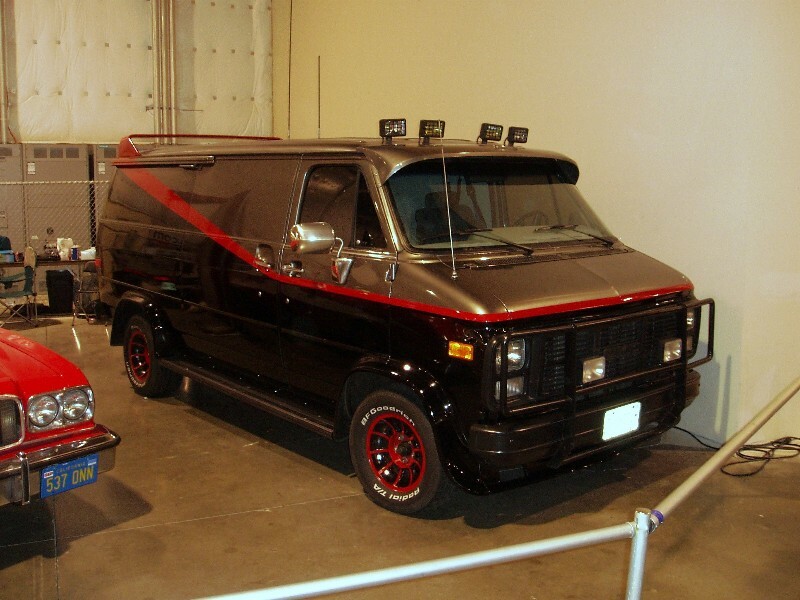 Hi all.im a huge fan of the a-team van and the show.i have been doing a good bit of research on what happened to the original screen used vans.like Craig Baxley said in the interview with Jerry there were 3 vans remaining when the show ended.the 2 first unit vans were kept by Stephen j cannell.the van with the sunroof was the main van used for the show.it was used for all close up and inside filming.basically what most fans would call the real van.cannell sold the other van to a man called peter nelson in 1992.he used to own a TV and movie vehicle museum in Keswick England.this van was bare inside and was used for chase sequences and scenes that didn’t require close ups.peter also bought the 3rd remaining van which was the stunt van that was kept at universal studios.peter nelson has sold all his collection to a famous vehicle museum in America.you can easily find photos of both these vans online.my guess is that the main van is still with the cannell family.he also kept BA’s gold chains. Hi Jerry.i loved the a-team and especially the van.your interview with Craig Baxley has got me wondering what happened to the 3 original vans that were left when the show ended.apparently there are 2 screen used vans at the dezer auto museum in Miami.they were bought from the now defunct cars of the stars museum in England.the former owner peter nelson said he had all title and paperwork from universal to prove it.i have read in a few different websites that Stephen cannell had another van but I haven’t found anything to back that up. Thank you for the informative article. I build scale replicas of TV/Movie vehicles and custom one off​ versions of individuals personal vehicles. When building a replica of a TV /Movie vehicle as with an individual’s personal vehicle, accuracy is a must even at 1/24- 1/25th scale. Research is everything. A bit off topic, but thanks for weighing in.